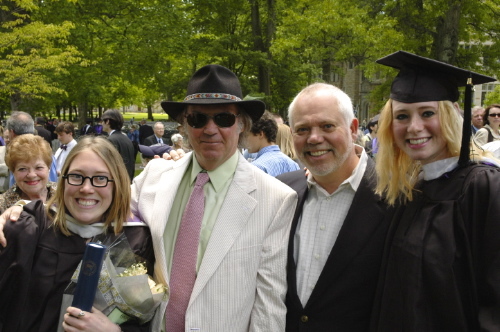 This weekend my wife Maggie and I went back to see our daughter graduate from Kenyon College in Ohio. What a kick! Many happy emotions – not the least being the end of college tuition payments and the chance she’ll get a job to support me in my old age. Kenyon is a terrific school and she loved it. She got a “synoptic degree” which combined elements of Anthropology, Psychology and Sociology. She’s hoping to find a job in the recruiting field this summer. One of her friends and co-grads is Amber (AJ) Young, Neil Young’s daughter. I managed to get a picture of the four of us, attached. I’ve been a fan of Neil’s music (and politics) since college, so it was a big thrill to meet him and share the same sense of pride at the same time. All in all, a very proud day. You’ll take a pic with a rock star but not a VC like me!!! !